Hillary Rodham Clinton's name will be placed in nomination along with nominee-in-waiting Barack Obama at the Democratic convention in Denver, an emblematic move intended to unite the party after a divisive primary fight. Democrats will officially nominate Obama at the convention but the state delegations will do a traditional role call for his vanquished opponent as well. The arrangement - which the rivals-turned-allies agreed to after weeks of negotiations - is intended to help the Democratic Party heal after a bruising primary while mollifying still-disgruntled Clinton backers and acknowledging the former first lady's groundbreaking presidential run. "I am convinced that honoring Senator Clinton's historic campaign in this way will help us celebrate this defining moment in our history and bring the party together in a strong united fashion," Obama, an Illinois senator, said in a joint statement. Added Clinton, a New York senator: "With every voice heard and the party strongly united, we will elect Senator Obama president of the United States and put our nation on the path to peace and prosperity once again." CBS News chief political consultant Marc Ambinder reports that Clinton had resisted pressure from donors, allies and supporters to accept demands to allow her name placed in nomination, but she and aides to Obama seemed to realize independently that doing so would be the best way to incorporate and welcome Clinton's supporters into Obama's general election campaign, both symbolically and practically. Ambinder reports that according to several people who have spoken with her, Clinton originally believed that if her name were included in the roll call, she would inevitably wind up with fewer delegates than the 1896.5 she earned from the primaries. In negotiations this summer with Obama's campaign, Clinton's team did not ask for Clinton's name to be submitted. But within the last week, Clinton advisers decided something ought to be done for the sake of her staunchest supporters. They heard back immediately that the Obama campaign had always been open to having her name placed in nomination alongside his, reports Ambinder. Clinton will speak on Aug. 26, the second night of the convention. As CBS News correspondent Dean Reynolds reports, Clinton ruled out giving the convention keynote address - the same vehicle that catapulted Obama to national prominence four years ago. On Aug. 27, the state-by-state roll call of her name will take place. While Democrats say the mechanics of how that will play out still are being determined, Clinton - herself a superdelegate who gets a vote - is expected to release her delegates to Obama, announce her support for him and ask her backers to do the same. Her husband is slated to address the delegates that day, too, as is Obama's still unnamed vice presidential nominee - yet another strong indication that he won't ask Clinton to be his running mate. Some 35 million people participated in the protracted Democratic primary, and Obama and Clinton said they wanted to "honor and celebrate these voices and votes" by putting both of their names into nomination. Certainly, they also hoped to head off any disruptions that could give Republicans - and the national media televising the four-day event - an opening to claim Democratic disarray. 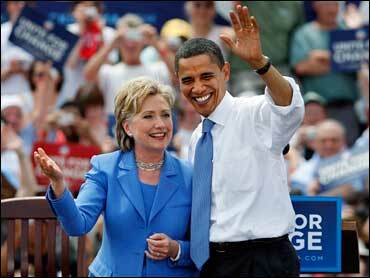 Obama needs Clinton's supporters to beat McCain in November. While polls show that Obama has won over most of the Clinton faithful, some simply don't like Obama or still feel Clinton was treated unfairly during the primaries. Critics have indicated they would make their voices heard during the party's Denver party in less than two weeks. One group intends to paper the city with fliers, promote a video detailing what they contend were irregularities in the nominating process and unleash bloggers to give their take on the proceedings. These Democrats have accused Obama of manipulating party caucuses for extra delegates while others complain that Clinton was the victim of sexist party leaders or media mistreatment. Many vent over the way the party divvied up delegates from the Florida and Michigan primaries, two states that were punished for violating national rules by holding their contests early.